Savannah, Georgia – Just 80 or so miles from the villa is Savannah, Georgia. My in-laws went there earlier in the week and were very pleased withtheir trip. Shannon and I opted not to go with them, but today, unknowns to me, the Tybee Island Lighthouse is located just outside of Savannah, and we decided to go see it. My in-laws wanted to come along for the ride. On the way we had a lengthy discussion about our GPSwhich helped us navigate to our destination without incident. My in-laws have a Magellan that they are not happy with and I was touting all the features of my Delphi Nav200. Their son, David, has one as well and they were going to look into getting one. I say “were” for a reason…read on! 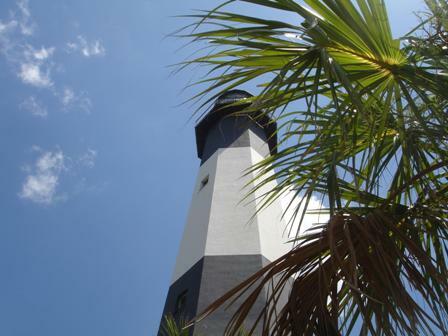 The Tybee Island Lighthouse – A very picturesque setting plays home to this stripped behemoth of a light. Black and white and almost 200′ tall and Ordered by General James Oglethorpe, Governor of the 13th colony, in 1732, the Tybee Island Light Station has been guiding mariners safe entrance into the Savannah River for over 270 years. The Tybee Island Light Station is one of America’s most intact having all of its historic support buildings on its five-acre site. Rebuilt several times the current light station displays its 1916 day-mark with 178 stairs, and a First Order Fresnel lens (nine feet tall). Believe it or not, I was able to make it up all 178 steps to the top and what a spectacular view of the ocean, and the surrounding fort. The cost was $6.00 for adults and $5.00 for seniors. Certainly worth it considering how beautifully the grounds and the light are kept up and cared for. I didn’t make it to the houses surrounding the lighthouse (I was taking too many pictures), but Shannon said I should have, she was very intrigued with the history. 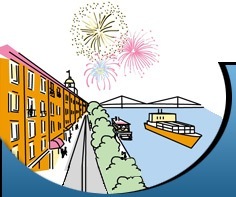 Downtown Savannah, River Street – With being so close to downtown Savannah, we had to stop by the River Street Shops. We originally were looking for the Peanut Shop. My in-laws had purchased a huge can of some of the best peanuts I have ever had, WAY better than Planter’s ever dared to be, and we wanted to by some for ourselves. In addition to the large can of peanuts, we bought cashews, mixed nuts, and some New Orleans flavored peanuts. On our way to the Peanut Shop however, we were detoured by the smell of the Savannah Candy Kitchen where they make pecan praline and give out free samples. This was so mouth watering we had to buy some. We also bought several of their other treats including their Divinity, roasted pecans, and salt water taffy. Everything tasted so wonderful! If you are ever in Savannah, this entire strip is an absolute MUST! Of course no trip would ever be complete unless we plugged in a yarn store. We did just that and using our VZ Navigator located a store called Wild Fibre. If length of visit is any indicator here, Shannon really liked this store. She walked out with a bag chocked full of yarn, and a pattern. She is a woman on a mission now for sure. She spent about $75, and was thrilled with the store. I was content to sit in the car like I almost always do and keep the chariot ready for the Queen of Knitting! Shannon would highly recommend this store for knitters if you are in the area. There website is http://www.wildfibreyarns.com/1.html. It is located at 409 E. Liberty Street in Savannah between Habersham and Price Streets (Map HERE). GPS Crash – Nicknamed “Betty” my GPScrashed on the way out of Savannah. 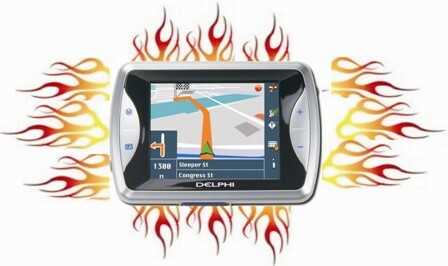 After all the bragging and promoting I did for this fantastic product, the Delphi Nav200 locked up and would not provide us with directions back to Hilton Head. At one point, I was getting so frustrated (yes me), we were driving over some railroad tracks and I threatened that if she didn’t start working, I was going to toss her onto the tracks! I even went as far as to re-name what GPS stood for…GETTING PRETTY STUPID! Fortunately, I had my VZNavigator for a back-up. I am amazed and ashamed at the same time how dependent we have become on technology. I know I could have broke down and bought a map, but witha $200 unit, and a $200 phone, both with GPS, I couldn’t bring myself to do it. The VZ worked just fine and we made it home, only to have Betty kick back on. The error message I was getting was, “non-sufficient memory to perform this operation.” I think she may have gotten over-heated. We used her for the rest of the our entire vacation without incident.